As a specialist programme management business we’ve published a number of articles over the years highlighting the mind-set and behaviours that make for successful programmes and, paradoxically, have lamented on why the statistics for failure remain stubbornly high. Unsurprisingly there is a correlation between the two; if you don’t take on board the former, you’re more than likely to contribute to the latter. Frustratingly, the same issues headline today as those we highlighted over twelve years ago (you can read more on this in our article: Why right first time matters). However, there is one attribute that stands above all others when it comes to determining a programme’s success and that is the absolute necessity for sustained executive sponsorship. Of course, it’s not impossible to deliver major change without it, but I would argue that even the best prepared, most realistically costed and well resourced programme is likely to fail or fall well short of expectation if it’s not there in abundance – right across the senior management team. This is something I drive home in discussions with new clients because I see it as a key test of whether they really understand the implications of change and are taking it seriously. Unless someone has been through a major programme of change, it’s easy to underestimate how hard it’s going to be. Again, we’ve written before on the tendency of senior management to assume that change can be brought about as a function of normal business operations and the associated folly of expecting those who are already maxed out running the business, to simultaneously change it. To successfully deliver change there must be a clear separation of duties with resources who can provide the essential knowledge of the business released from their day job and committed to support the delivery programme. This need not be a full-time commitment but must be for sustained periods throughout the programme’s lifecycle as they are an essential part of any programme team. The double whammy is that programmes require high performance teams and so the people required are likely to be amongst the best in the business; if it’s not painful to release such people then they are almost certainly the wrong ones. This is a primary area where a change programme can come into conflict with the business and it brings us right back to sponsorship and executive support, because it is only at this level that such conflict can be resolved – or better still, avoided from the outset. Enlightened organisations get this right and they are a joy to work with. Some years ago we led a major programme to transform the finance and customer services functions for a UK airline. As part of the definition and planning stage of each workstream we helped the airline’s executive team understand the scale of investment they would need to make in people, time and money to get where they wanted to be. To their absolute credit, they never missed a beat, ensuring the programme was given the right level of support and priority throughout the business and delivering on their commitments at every stage along the way. Result – the programme was delivered on time, within budget and made the planned business returns within the first year. Contrast this with another client scenario, where a successful outcome was eventually reached, but the amount of effort and pain it took to get there was off the scale. So why was the experience so fundamentally different? Admittedly, there was additional complexity in this programme, with a diverse business culture spread across multiple, global locations. Core to the investment case was the harmonisation of business processes that would drive economies of scale, reduce costs and substantially improve operational quality. Given the organisation’s history of local autonomy this was never going to be an easy nut to crack and it wasn’t long before the effects of inter-group politics were being felt by the programme. With this came the inevitable passive aggression where the words and actions of some key stakeholders were wholly out of alignment and clearly detrimental to the programme. 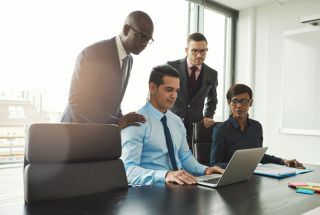 Behaviours like this are part and parcel of every business change programme, but it was the extent to which these were ingrained within the client’s wider senior management team that made the problems so intractable. Despite having a strong and supportive business sponsor it was incredibly difficult to make headway against the political machinations being played out within the business. This manifested itself in a number of ways, for example, key resources not being released from the business as planned and tasks actioned half-heartedly and not completed to the required level of quality. Underneath all this though was the simple truth that, however much the group’s executive team claimed otherwise, there just wasn’t enough support for the programme at that level. This was a handicap at the best of times and debilitating during those periods when the going got particularly tough. Sticky patches are an inevitable part of any programme and a time when you expect constructive engagement with your sponsors - misplaced, critical detachment doesn’t help anyone. Those who have been through a programme of change, in whatever capacity, will know they are not for the faint-hearted. Arguably, the person most actively in the line of fire is the programme manager and it is the experience, leadership, energy and courage that he or she brings that often defines the character and resilience of the programme. Yet, without the overarching support of the sponsor and other members of the organisation’s senior management team, this can all be for nought. I would urge any business stealing itself for change to take time to ensure this team is demonstrably on board and fully engaged with its responsibilities and obligations to the enabling programme and has the mind-set to provide the sustained levels of support required to achieve a successful outcome for all.